Shopping for a new Lexus IS? This Lexus IS feels most purposeful when equipped as a driver’s car: rear-wheel drive, the IS 350’s V-6, and the F-Sport package. The 2019 Lexus IS has sports sedan intentions, but it needs more underhood muscle and fresher styling to keep pace with German rivals. Though the IS wears various sharp cut lines around the exterior, its overall shape doesn’t inspire. The interior is richly finished and can delight audiophiles with its optional Mark Levinson sound system, but a tight rear seat makes it about as practical as a coupe. Power begins with the IS 300’s turbo-4 mated to an 8-speed automatic and rear-wheel drive. The setup carries a promising 241-horsepower rating but ultimately lacks finesse as a team thanks to the automatic’s indecisive nature. A 3.0-liter V-6 swaps in with all-wheel drive for a step up in cylinder count on the IS 300, but though the larger and more powerful 3.5-liter V-6 in the IS 350 is much more rewarding to drive. An optional F-Sport trim enhances the capable chassis but is no match for the long-gone, V-8-powered IS F An available all-wheel drive system brings peace of mind to those in the snow belt. The Lexus IS handles with verve, aided by a balanced chassis and grippy tires on most versions. Beware that not all versions ride on all-season tires, so snow rubber might be worth budgeting for buyers in wintry climates. If a spacious interior with room for at least three is a critical requirement, the Lexus IS shouldn’t make your short list. 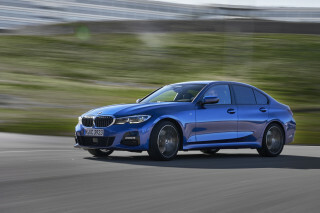 The IS is best suited to keeping the front passengers happy, which isn’t necessarily the case with its BMW and Audi rivals. The IS includes a suite of active safety gear standard, though it earned uneven crash-test scores. Another caveat is that its infotainment system—especially the mouse-like controller used for most functions—is in need of a total reboot. Simple tasks are frustrating and there’s no Apple CarPlay or Android Auto compatibility. The 2019 Lexus IS demonstrates great attention-to-detail, but its style isn't for everyone. Up front, the Lexus IS’ headlights bring a high-tech appearance to its front end, but they don’t distract from its overwhelming grille. Limited shaping to the IS’ sides draws the eye to the wheels, which are pressed outward tucked within sharply creased wheel wells. The look makes for a performance-minded stance, although the heavy-looking front end fails to capitalize on the inherent balance afforded by the rear-wheel drive layout. The 2019 IS sedan’s interior is best appreciated up close. The cockpit sensation is created by its wide center console, high beltline, tiered dashboard, and physically narrow cabin resonate with its driver-focused intentions. The analog clock, which adjusts via GPS, and finely designed analog gauges lead suggest precision and detail. A wide range of upholstery and trim options slather the Lexus’ interior in real wood or aluminum and buttery soft leather—for a price. If only as much attention had been paid to the back seat—read on. Not all of the 2019 Lexus IS’ multitude of configurations are as well-honed as they should be. Lexus reprogrammed the IS 300’s 2.0-liter turbo-4 this year, but its 241 horsepower and 258 pound-feet of torque remain the same as last year. We’ve not yet driven the 2019, but we doubt the changes will totally alter its personality. Last year’s model provided decent thrust but its 8-speed automatic wasn’t the most willing of dance partners. The base IS 300 is a better bet than the IS 300 with all-wheel drive, which has the same name but drops in a 3.5-liter V-6 rated at 260 hp. It’s smooth, but power delivery requires lots of reving and it uses a less-sophisticated 6-speed automatic. For as much as Lexus charges, the IS 300 all-wheel drive is a curious step backward. Confusingly, the IS 350 also has a 3.5-liter V-6 underhood, but keep reading. Instead of a bag of coal, this one’s a gem: 311 hp and 277 lb-ft of torque paired to an 8-speed automatic transmission with rear-wheel drive and a 6-speed automatic with all-wheel drive. The IS 350’s V-6 provides linear power delivery and reacts quickly to inputs. Here, the 8-speed automatic seems tuned perfectly to the engine. Regardless of what’s underhood, the IS has sharp handling and a firm ride that’s composed in most situations but can be too busy on choppy pavement thanks to a relatively short wheelbase. Helping enhance the powertrain are four selectable drivetrain modes. The energy conservative Eco mode slows throttle response and overall power demand leading to a sluggish driving experience. The system defaults to Comfort, which encourages early transmission upshifts in the name of fuel economy. Sport mode is positioned for enthusiastic winding road attacks and the even more “extreme” Sport+ mode, included with the F Sport package, commands the transmission to hold the lowest gear possible. The F Sport package also brings adaptive dampers and a limited-slip differential that move the IS closer to the BMW 340i or Mercedes-AMG C43. Closer, but still not that close. 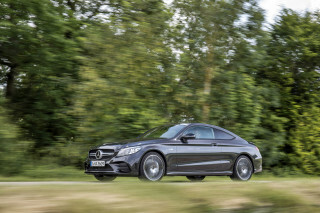 The IS lacks those sedans’ immediate thrust and balanced handling. The 2019 Lexus IS is short on spaciousness, but its details and materials impress. The 2019 Lexus IS feels a design generation behind the competition in regards to interior space, especially for rear passengers. Up front, the IS’ seats are firm and power-adjustable. The optional F Sport trim’s seats have beefier bolsters, which may be uncomfortable for larger-framed occupants. Try before buying. Rear seat passengers may wonder what they did to deserve such little leg and shoulder room. The IS is almost as cramped as a coupe, even though it has four doors. The tight cabin ensures controls are within reach, but the touch-sensitive climate control system can’t be used when wearing gloves. Trunk space is reasonable for a car this size at 13.8 cubic feet, but interior storage is lacking. Overall, the IS interior materials have a satisfying feel. Optional wood and aluminum trim gives it a bucks-up look against some drab rivals. If you’re sold in a Lexus, the From the Lexus point of view, the front-wheel drive ES sedan will satisfy those who prioritize space over sport. The 2019 Lexus IS is well-equipped with collision-avoidance tech. 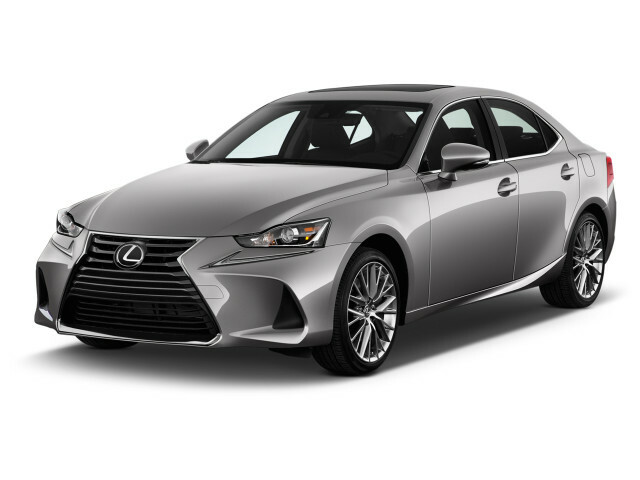 The 2019 Lexus IS comes standard with laudable active safety tech and earned generally good scores in crash testing. 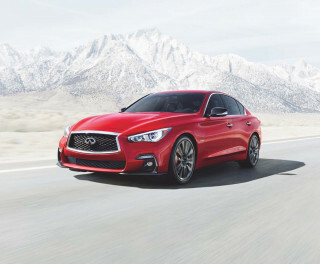 The 2019 IS is equipped with standard suite of active safety equipment: active lane control, adaptive cruise control, and automatic emergency braking. Options include blind-spot monitors with rear cross-traffic alerts. On the ratings front, the NHTSA awards the IS with a five-star overall rating, though it scored four stars for front-impact protection. The IIHS calls it a Top Safety Pick thanks to good performance in its barrage of crash tests, an automatic emergency braking system that rates “Superior,” and “Acceptable” headlights. The 2019 IS has not been subjected to the challenging passenger-side small overlap front crash test that simulates impact with a stationary object such as a utility pole, however. The list of standard features on the 2019 IS is extensive: a 7.0-inch infotainment display, 17-inch wheels, LED headlights, synthetic leather upholstery, and a moonroof. At about $39,000, the base IS 300 offers a decent value against its rivals. Selecting the Premium package adds heated and cooled front seats, blind-spot monitors, auto-dimming exterior mirrors, and rain-sensing wipers. Other packages upgrade the infotainment screen to a 10.3-inch display, add a 15-speaker Mark Levinson audio system, and swap in leather seats. The F Sport package can be added to any IS and includes a digital gauge cluster, upgraded front seats, silver-finish interior trim, adaptive dampers, and revised front and rear bumpers. For about $46,000, an IS 350 F Sport with rear-wheel drive undercuts equivalent German rivals by 10-15 percent. Paired with Lexus’ traditionally strong resale values and the brand’s red carpet dealer experience, it’s a sedan worth considering. Unfortunately, the IS 350 is let down by its complex infotainment system, which lacks Apple CarPlay and Android Auto compatibility—although it does now work with Amazon Alexa. The mouse-like controller is a nightmare to use, too. The 2019 Lexus IS isn’t going to win awards at the pump. The EPA ratings have yet to be published for the 2019 model year IS, but the mechanically similar 2018 model’s ratings fall short of the best-in-class. The 2019 Lexus IS falls short when it comes to its fuel consumption. With all-wheel drive, the IS 300’s ratings slide to a dismal 19/26/22 mpg. The rear-wheel drive IS 350 is rated by the EPA at 19/28/22 mpg. pting for all-wheel drive lowers the rating to 19/26/21 mpg. 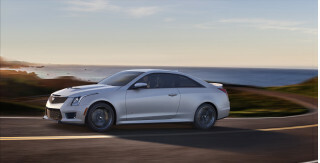 With no hybrid option and a premium fuel requirement, the 2019 IS is not among the thriftiest compact sports sedans. Looking for a different year of the Lexus IS?